D.O.T. approved with exceptional highway stability. F.I.M. approved rear tire for I.S.D.E. competition. Heavy duty reinforced construction for anti-puncture and cut resistance. 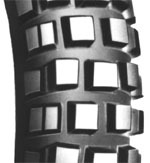 Large tread blocks offer excellent stability for more control. Offers strong traction in the mix of street and dual sport conditions.